Google has recently decided to try to tie in all YouTube accounts with Google+, a move which has attracted greater controversy than perhaps they expected. This move is part of the attempt to have real names on YouTube (rather like Facebook) in an attempt to promote transparency and prevent anonymous trolling and harassment. Of course, many YouTubers have been resistant to the push towards using real names on accounts. Many channels are a brand rather than simply one person – many of the most subscribed channels are company owned. The need for a brand on YouTube is something I’ve written about in the past, it’s far more common than someone releasing videos under their own name. Also, despite the problems of anonymous commenters, many people have good reason for wanting to stay anonymous whilst online, and there has been a lot of anger around the internet towards YouTube’s constant messages on accounts asking for real names. I get these a lot, as my account is not under my real name. It isn’t totally anonymous, but I like the name I chose and want to stick to it! Google’s latest push, whilst attempting to make YouTube more open has actually created bigger problem which could make the situation worse – it has made it much easier for use to impersonate others. Previously when a user commented on a video, the comment would show up with their channel name – and every channel name on YouTube is unique, much like Twitter. However, now a comment can show up under their Google+ name which a user can change to whatever they want. This has already resulted in video having problems with commenters deliberately pretending to be the video creator. Some larger channels have started disabling comments altogether to prevent this, their argument being that most comments are pointless and generally offensive so they won’t miss anything by not having comments. This video by creator Dave Chaos was made to explain how Google+ has already been used to impersonate a well known YouTube Personality, and his steps to try and rectify the problem for his own channel by getting his Google+ account ‘verified’ in much the same way that celebrities on Twitter have the blue verification ‘tick’ in their accounts. However his video documents a fairly arduous process and viewing his twitter since, he hasn’t managed to make much progress in solving the problem. Sadly, while I understand why channel owners would want to take these steps, all of this lessens YouTube as a social platform. While it doesn’t create cohesive communities, YouTube does allow for quick communication with the video makers, which is especially important in the ages of micro celebrities where communication with their followers, and fast discussion without switching platforms is an advantage to the videos, since the commentary is limited to that video rather than lost in everything else on another platform. Overall, YouTube may be undergoing massive changes in the way people use it to communicate, which will be interesting to watch in the next few months. I will hopefully be starting a project in mobile film making soon for my Masters Dissertation, and since it will be partly film based I decided to make a Vlog explaining a bit about what I’m going to do. This will be the first of several, but I’ll still be writing plenty of blogs. I recently found the web app/game ‘Plink’, and I’ve been completely addicted to it. 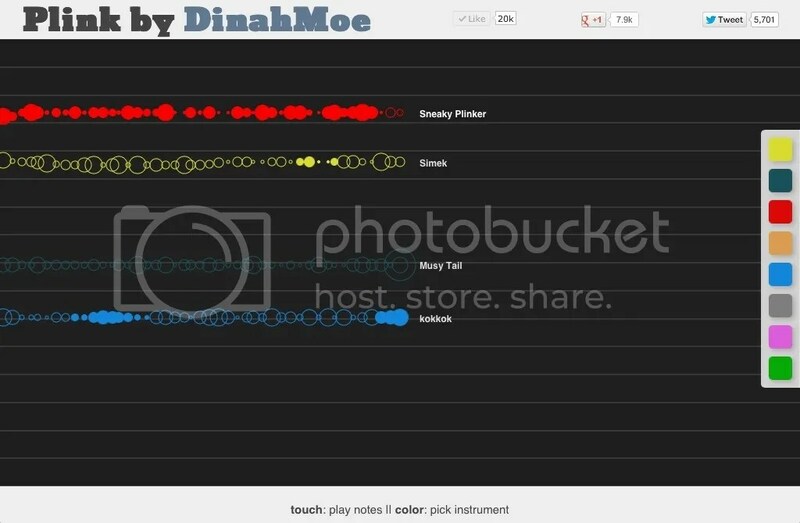 Plink is an experimental app built for chrome by creative audio company DinahMoe which allows people to create music to a continuous beat. It is fairly simple, you mouse click (or tap if using a touch screen) to create a note and you can change your ‘instrument’. While it is possible to set up sessions with friends, you can also play with a small group of random people. A screenshot of Plink. Each player has a trail of bubbles – solid ones show where notes have been played. The lines and gaps indicate the notes of the scale. The best thing I found about Plink was that while the game doesn’t force co-operation between players in any way, that co-operation happened anyway. It would be totally possible to disrupt the musical flow by tapping completely out of time to the beat, or dominate the session by constantly tapping, this didn’t happen at any point whilst I was playing, even though I felt that I almost expected someone to ruin the game (I think there’s another blog topic in there – do we always expect the worst in anything anonymous on the internet?) The music would soon fall into a pattern where one or two people would be creating the tune whilst the other players would be adding accompaniment and waiting their ‘turn’ just as you would in a standard Jazz session. I suppose it’s possible that most of the people who would be interested in something like Plink would already be musical in some way, but whether or not that’s true I was quite touched by the level of co-operation between users who were only nicknames on a screen. I’ve sometimes found that with many different online games, the less interaction the players can actually have with each other the more they do co operate, and can even find ways to communicate using the tools available – I had several ‘duets’ with other players where we copied each others musical phrases or tried to respond to a phrase with something appropriate. I found literally as I was writing this blog that DinahMoe have made a number of other sound-based games which sound amazing and I’ll be checking them out right after this.